Father Shaji Varghese, administrator of Our Lady of Guadalupe, was stabbed nine times, beaten and kicked allegedly by David Rodriguez after morning Mass at the church May 8. 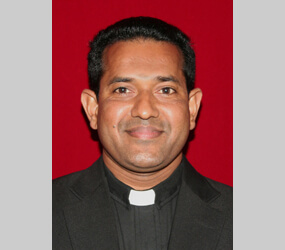 As of May 15, Father Varghese, 42, was reported to be in stable condition and was expected to make a full recovery. He was moved to a private room after spending several days in the intensive care unit at Christus Spohn Memorial Hospital in Corpus Christi. Rodriguez, 36, was arrested shortly after the attack and remained in custody in the county jail. Father Varghese, a native of India, has served at the parish for a year and a half. A press release issued by the diocese stated Rodriguez is “mentally disturbed” and is a parishioner of Our Lady of Guadalupe. In his homily during the May 10 Mass at Our Lady of Guadalupe Church, which also was rededicated because of the violent act that took place there, Bishop Carmody offered his sympathy, prayers and love to the people because of the traumatic experience they had suffered. When a church is profaned by a serious act of violence, canon law requires that it be rededicated with a rite of reparation. It is to be celebrated as soon as possible, either as part of a Mass or a Liturgy of the Word. Until that time, no sacrament or other rite may be celebrated in the place. Among the crimes listed that bring about the desecration of a church is “a sinful and serious shedding of blood,” which occurred in this instance. The rite of reparation is to be celebrated by the diocesan bishop. Before the May 10 Mass, hundreds of parishioners and others gathered under the trees and in the parish hall. The church doors were securely locked as the bishop greeted and consoled them. After blessing water, the bishop processed through the dark church sprinkling the walls of the building with the water, including the spot where the stabbing occurred, as a sign of purification. As he returned to the sanctuary, the lights came up and the choir began a joyful rendition of the Gloria. The church had been stripped of its usual symbols. The main altar was bare, the tabernacle was empty, with its door left open, and all the candles, altar linens and other altar appointments had been removed. There were no flowers on any of the altars.